In satellites, onboard software is required to perform complicated mission sequences and autonomous scheduling, conduct preliminary data processing, and manage various onboard devices. The dependability of onboard software strongly affects the reliability of a satellite itself. Therefore, the onboard software must be both complex and reliable to perform complicated small satellite missions. We propose an automatic software generator to meet these requirements. This generates onboard software and a database for the ground operating system using satellite development documents, such as command and telemetry definition documents and fault detection, isolation, and recovery (FDIR) definition documents. By using this software generator, the software development load can be reduced and human error can be avoided, even if the definitions are modified in an ad hoc manner during the development process. The generator additionally enables the easy accommodation of user preferences and software depth variation during a mission. 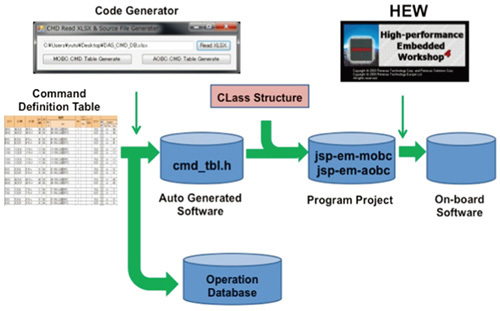 S. Kimura, Y. Asakura, H. Doi, and M. Nakamura, “Document-Based Programming System for Seamless Linking of Satellite Onboard Software and Ground Operating System,” J. Robot. Mechatron., Vol.29, No.5, pp. 801-807, 2017. Y. Aoyanagi, T. Totani, K. Yamaguchi, A. Nakamura, N. Takeyama, Y. Kanai, and S. Satori, “Status of VNIR Hyperspectral Sensor HSC-III development: Optical and Data Acquisition Subsystem,” Proc. of 61st Int. Astronautical Congress, Prague, Czech Republic, Sept. 2010. S. Nakasuka, “Evolution From Education to Practical Use in University of Tokyo’s Nano-Satellite Activities,” Acta Astronautica, Vol.66, pp. 1099-1105, Apr. 2010. A. da Silva Curiela, L. Bolanda, J. Cooksleya, M. Bekhtib, P. Stephensa, W. Suna, and M. Sweetinga, “First results from the disaster monitoring constellation (DMC),” Acta Astronautica, Vol.56, pp. 261-271, 2005. N. Rodriguez-Alvarez, X. Bosch-Lluis, A. Camps, I. Ramos-Perez, E. Valencia, and H. Park, “Vegetation Water Content Estimation Using GNSS Measurements,” IEEE Geoscience and Remote Sensing Letters, Vol.9, Issue 2, pp. 282-286, 2012. S. Kobayashi and S. Kimura, “Software Development System for On-board Computers of Small Satellites,” Proc. of The United Nations/Japan Nano-Satellite Symposium, 2014. S. Kimura, T. Kamijo, Y. Aoki, and S. Kobayashi, “A Software Development and Verification Platform for On-Board Computers on Small Satellites,” The Advances in the Astronautical Sciences Series, Vol.146, pp. 415-422, 2013. T. Kamijo, S. Kimura, Y. Aoki, and S. Kobayashi, “A Class Structured Software Development Platform for Onboard Computers of Small Satellites,” Proc. of Int. Symposium on Artificial Intelligence, Robotics and Automation in Space (i-SAIRAS), 2012. M. Uetsuhara, K. Fujimoto, and N. Okada, “IDEA OSG 1: Prelaunch Status Report,” Proc. of the 7th European Conf. on Space Debris, Darmstadt, Germany, 2017.